I watched the Grammys last night and tried to be open minded and less judgmental than usual. Instead of just evaluating every performance and award choice, I made an effort to just watch and enjoy them. As someone who takes music seriously and tends to follow artists who are not well known, the Grammy's and other popular music award shows usually just bother me because they seems like more of a popularity contest. Bon Iver said it best when he mentioned how a lot of great artists that deserve to be nominated are not there. You can't really blame them though. There are only a few spots in each category and thousands of artists fighting for those positions. Not to mention the fact that people's interest in music varies so vastly. In the end, it's the ones that appeal to the greatest number of people who are then nominated and may go on to win the award. Overall I enjoyed the show and think they did a nice job with it. It seemed like there were more performances than actual awards. I counted about 3 awards in the first hour and half. What I liked about this show was how they really had something for everyone. The represented many different genres of music and eras of music. I think a lot of times the older generation doesn't get into it because it's just the new hip music that the kids are listening to, but this year they had several performers from the older generation. I could go into individual reviews of each performance and award choice, and believe me, I have opinions, but I think I stay away from that angle and just focus on the big picture. 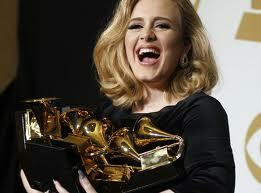 At the 2012 Grammys music was celebrated and there were no major mishaps or controversies. Artists were grateful and I think most people went home happy. It's not really about who wins or loses rather it's a show that features what was most notable in the past year of music.